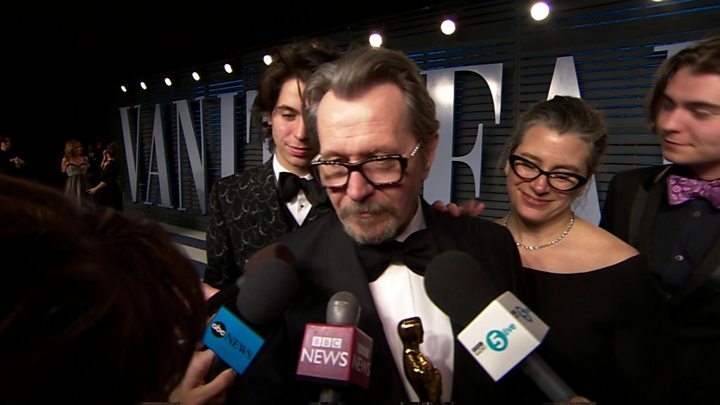 Gary Oldman's son has written an impassioned letter defending his father after accusations of domestic violence resurfaced following his Oscar win. Gulliver Oldman published the letter after Gary won best actor for playing Winston Churchill in Darkest Hour. Ex-wife Donya Fiorentino, who accused him during their divorce in 2001, said the Oscars had rewarded "an abuser". The actor has always denied abuse, and his son said: "There is only innocence. There never has been any guilt." Media captionGary Oldman: "I don't know what mum doesn't want an Oscar for their son"
During their divorce proceedings, Fiorentino accused Gary Oldman of hitting her repeatedly with a phone receiver when she tried to call the police. Gulliver was three at the time. After they split, a court awarded the actor sole custody of Gulliver and his younger brother Charlie. In his letter, Gulliver wrote: "I was there at the time of the 'incident,' so I'd like to make this radiantly clear: it didn't happen. Anyone who says it did is lying." He said it had been "troubling and painful" to see the "false allegations" dredged up all these years on. "Custody of children is not given to a wife beater, and under most circumstances, hardly ever a man," he wrote. "My having lived, full time with my father should be in itself, proof enough." He described his father as "my one and true guiding light" and "my only hero", and said he stopped talking to his mother seven years ago, when he was 13. Gulliver also described his father as "a wonderfully kind man, gifted beyond belief, a man who wouldn't trade anything for the love and happiness of his family". He added: "This torment should have ended 16 years ago. In such a momentous year for his career, my father should finally be able to enjoy himself. I hope that we can please make that a possibility. "The only way to achieve that is to stop repeating, stop sharing, and stop believing the lies." After the Oscars, Fiorentino sarcastically congratulated her ex-husband and the Academy, and told TMZ: "I thought we had evolved. What happened to the #MeToo movement?" Oldman's representative Doug Urbanski responded in a written statement to the BBC, saying: "Gary was completely cleared of those allegations in 2001... and there were results and consequences." He added that the Time's Up and Me Too movements were "critical and long overdue", but said it was "unfortunate" that Fiorentino was using them "as convenient cover to further a personal vendetta".